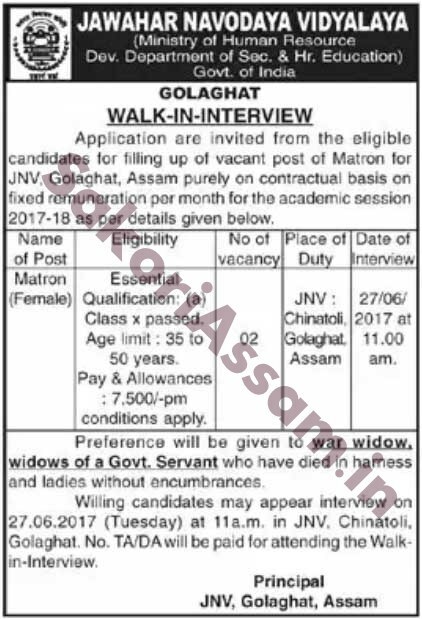 Application are invited from the eligible candidates for filling up of vacany post of Matron for JNV Golaghat, Assam purely on contractual basis on fixed remuneration per month for the academic session 2017-18 as per details given below. Age: 35 to 50 years. Preference will be given to war widow, widows of a Govt. Servant who have died in harness and ladies without encumbrances. Willing candidates may appear interview on 27.06.2017 (Tuesday) at 11 am in JNV, Chinatoli, Golaghat. No TA/DA will be paid for attending the walk-in-interview. For more details you can see the official advertisement from below.